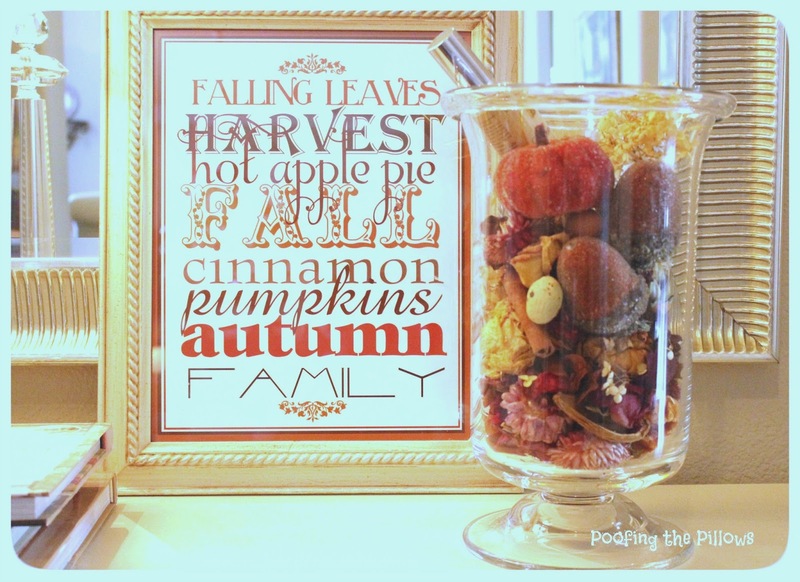 wonderful seasonal printables are so easy to find on Pinterest. We don't have a color printer so I uploaded the file to Walgreens. In about 30 minutes for around $8.00 for an 11x14, I had new artwork. Don't you love little projects that come together really quickly? Love your post - that printabl3e is to die for awesome - may have to steal that idea, too! Getting less "warmth" (read: yellow) in your pics is easy - sign up free for PicMonkey..........tab on left that says COLOR then just turn down warm and there ya go. I use it all the time because my pics are always too warm too. Happy playing with your photos! Great printable!! I love how keeping one frame and switching out the printable can inspire a whole new look! 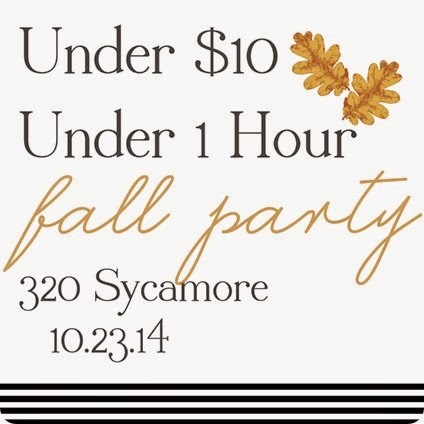 I love the typography on this printable, thanks for sharing. It's adorable and it looks great on your entry table. Your new artwork looks great, Stacey. Don't you love how easy it is to get things printed at places like Walgreens? So affordable too! I love your fall entry! Wall sayings are so easy to add to decor and yet they make such a nice statement. Isn't it nice people will share things? Such an easy project and it looks so good where you have it. Great idea and it looks so welcoming. I also love the scent you are using. I love this, Stacey! I never thought to use Walgreens! It looks great and I love the frame! That's a perfect way to add a touch of Fall to the entryway! Looks so pretty too! Pretty and inexpensive for some seasonal framed art, Stacey. I used the same printable and framed it for the vignette I set up on our refrigerator. You are right, there are so many to choose from on Pinterest and I am so grateful to those wonderful bloggers who share them. It is indeed a perfect little fall pizzazz. Thanks for sharing. Such a cute idea, Stacey! Love your vignette. I see you like Cinnamon Cider, by Aromatique, as well! 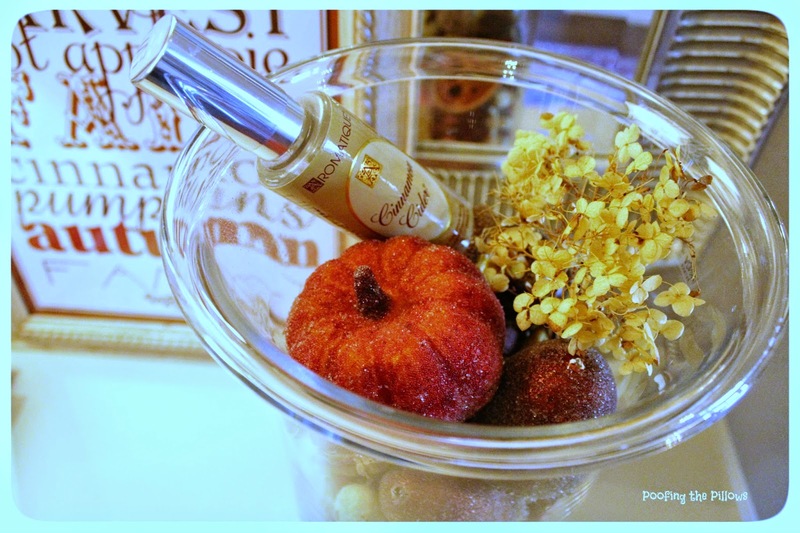 It has been one of my "go to" Fall scents for over ten years! So cute for fall, your entry looks great! I see printables like this one on Pinterest all the time, but I never really stop to think about what they could become. Yours looks great and so simple. I may have to go and poke around a bit more and fill up a frame or two for the holidays! What a great find! I bet your place smells divine with that Cinnamon Cider scent. Yum! Love this printable and I really like that you change it out for the different holidays. Very clever. I love it! 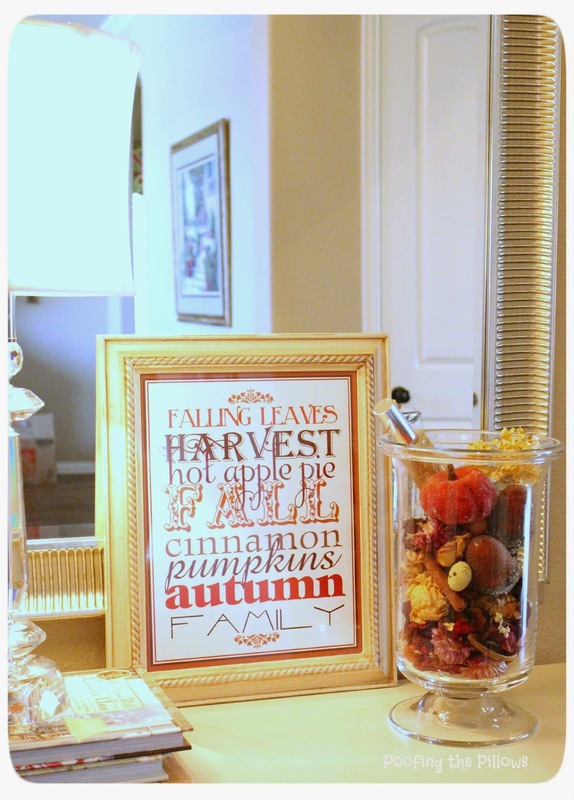 Never thought about sending printable to Walgreen's, what a great idea :) The frame is gorgeous! I love switching out some of our our artwork around the house for free printables. Love yours and your welcoming entry. Oh I love it!! Great idea and so inexpensive! You are so smart. Awesome printable! Isn't wonderful that so many people make these wonderful printables available for free! That's a wonderful print! Love the pot-pourri too which reminds me I have some I never put out!